When Major General Howard Stern is assassinated in Hong Kong (apparently someone’s not a fan), and further suicide attacks occur in Kuala Lumpur and the Philippines, the U.S. government calls in American commando/American hero/American badass Robert “Bob” Ross (O’Keeffe). This guy isn’t painting fluffy little clouds anymore. All Ross wants to do is get legal custody of the son he had in Vietnam with his now-deceased wife, and bring him back to the good old U.S. of A. But the questionable Senator Blaster (Pleasance) (shouldn’t that have been O’Keeffe’s name in the movie?) forces him to go on a dangerous mission in order to find his son - track down the evil russkies Col. Galckin (Svenson) and his henchman Talbukin (Anderson) and their never-ending army of goons, and eliminate them. In order to do this, Ross teams up with an in-country contact, Toro (Dell’Acqua), as well as those sympathetic to his cause, McDouglas (Pigozzi) and his daughter Mary (Erlandson, who has an impressive resume of these types of movies). Ross even offers to take Mary back to America along with him and his son...but under such heavy fire, will they all make it? Blow-ups, shooting, O’Keeffe punching people, exploding huts, exploding guard towers, guard tower falls, exploding helicopters. It truly never gets old, unless it’s done wrong. And as we always say, the Italians made the best jungle-set exploding hutters, and here is no exception. Bruno Mattei is at the helm for this particular leafy-green violence fest, and he doesn’t disappoint. His work can be hit or miss, to say the least, but this is a minor hit. Minor because fellow O’Keeffe-starred Italian jungle epic The Hard Way is better, but Double Target hits the mark, if I may keep the shooting theme going. The only real flaw is that it’s about eleven minutes too long. Yes, eleven. Probably because they tried to develop certain dramatic themes, and that takes time. We’re always crying out for more character development, so it would be hypocritical of us to criticize the filmmakers for that, and we won’t. But there’s only so much of Donald Pleasance sitting at a desk coughing into his inhaler that any audience can reasonably stand. To be fair, though, his scenes with Mike Monty are perfectly fine, and when Pleasance, Monty, and O’Keeffe are all together, it’s a B-Movie action fan’s dream come true. O’Keeffe has never been cooler, and that’s saying something because he’s usually pretty darn cool. It’s a joy to watch him mow down evil Russians, charge through fruit cart chases, and ignite entire villages with his rocket launcher. He even takes on a shark in an amazing bit of man-to-shark combat. That was definitely a movie highlight. It’s all set to an ace Stefano Mainetti score, which helps a lot. Mainetti also did the music for the closing song, “Losing You”, sung by Rosanna Napoli. It’s always funny when, after a viewer is subjected to 102 minutes of violence and bloodshed, a tender, romantic ballad plays over the credits. It’s all part of the anti-mainstream, illogical fun that comes with these pre-CGI-era blow-up movies. In misspelled credits news, we are informed of the many people that worked hard on the Philippine Crow. They must have meant “crew”. When English isn’t your first language, unpredictable things can happen when you try to print it on screen. Once again, it’s part of the unique experience. Either that or they employed a Philippine crow to relay messages back and forth amongst the crewmembers on the set. Seems economical. 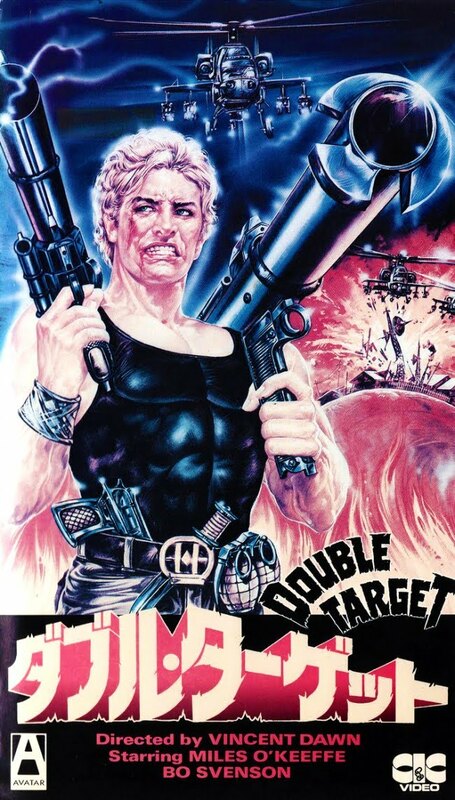 Never released in the U.S., Double Target represents the exploding hut era well, with some really nice explosions and some other fine attributes. Really only because of its slightly overlong running time does it not reach the heights achieved by some of its competitors, but it is a more than worthy addition to the ‘cannon’, if you will. Also check out a write-up by our buddy, Cool Target! All four jungle actioners, not slogs, O'Keeffe did in 1987-89 are worthwhile. Double Target and The Hard Way are both solid and must-watch movies. Hell's Heroes would be better if the picture, at least in my version, wasn't so dark. But the best of the bunch is Phantom Raiders, with O'Keeffe as a Rambo-ninja. It also has Kenneth Peerless as an overweight, grey-bearded, flying(!) ninja. You're absolutely right. O'Keefe delivered the jungle goods. The Hard Way is great. Loved the end of Silva in that. Haha.